It is no secret that I have a slight obsession with reusable water bottles. We have a Klean Kanteen for every person in the family plus a couple of spares. We rarely leave home without them. So when Mighty Nest offered to send me a Lifefactory glass water bottle to review, I couldn't resist. I love drinking out of glass, so I was very intrigued. I have been using the bottle for over a week now and love it. I enjoy drinking out of glass and it is really easy to drink from the wide mouth top. I found that I drank more water during the week too. I think it helped to be able to see how much water was left in the bottle. It is also dishwasher safe, which is a HUGE plus. The only drawback that I found was traveling in the car. I usually use a klean kanteen with a sip top, so all I have to do is drink. With the glass bottle you have to screw the top off, which isn't always the easiest while driving. Overall though I love the bottle. It will definitely be my go to water bottle. You can find the water bottles here. 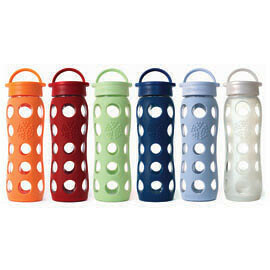 Mighty Nest is offering all my readers 10% of the Lifefactory Water Bottles-the 22oz, 16oz, and oz. Just enter coupon code NGM10 at checkout. The coupon is valid until Sept. 15, 2011. Disclaimer: Mighty Nest did send me the water bottle to review, but I am not being compensated in any way by Mighty Nest. I hate drinking out of plastic and even metal sometimes doesn't cut it for me. So as I sit here and sip my water in my special glass that I love I'm thinking I could totally get onboard with these too! I so love glass for drinking water or anything for that matter. I saw these just yesterday and I thought gee, I would love to have one of these. Now I now I want one. I will have to try these. I use porcelain reusable coffee cups (I hate those plastic ones) because I think the coffee taste better and like you said a big plus is the ability to put in the dishwasher.